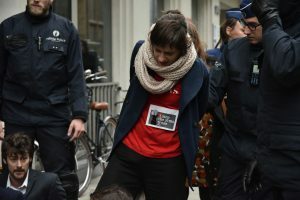 For the fourth year in a row, peace activists took action at a conference in Belgium of the European Defense Agency (EDA). Four hundred arms dealers, lobbyists from the arms industry and policy makers met together about the future of European defense. The conference took place behind closed doors, where critical voices may not enter. Dozens of peace activists, including a member of the European Parliament, presented themselves at the entrance to the conference on the morning of November 23. They were dragged away by the police. Seventeen peace activists were arrested. “We are not going to put our security in the hands of the arms industry anyway. That only leads to more arms exports, more violence, more war,” said one of the activists of I Stop the Arms Trade. 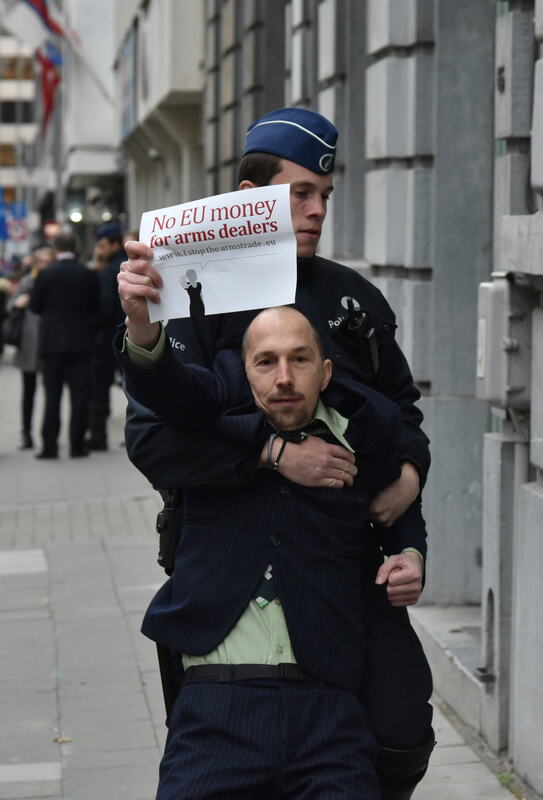 “While European member states are forced to cut their social security, billions of euros are being channeled to the arms industry.” said another activist in attendance today. The weapons lobby is very much within the European structures. The lobby budget of the ten largest European arms companies has doubled in five years from 2.8 million euros to 5.6 million euros per year. With results! The new Vredesactie report ‘Securing Profits, how the arm’s lobby is hijacking Europe’s defense policy ‘ shows how decision-making within the EU on issues such as security and defense is dominated by the arms industry. In some cases, the European Commission almost literally copies the advice of the arms lobby. Neither the civil society nor the European Parliament have any substantial say. Last week, the European member states launched a clause of the Treaty of Lisbon, PESCO. The 23 member states participating in this commitment commit themselves to spending more on defense and on the purchase of military equipment. Central to PESCO is a EUR 40 billion European Defense Fund for research, development and purchase of new weapons.